Ultra compact drills are on everyone's wish list and Festool now has their fans covered with their very own 10.8-volt. Their new CXS drill has a special design that is said to offer better ergonomics and more comfort. Most other ultra compact drills use a battery-in-handle design because there is really no other place to put the battery. Festool chose to go with a D-handle design similar to their other drills, and moved the battery to the bottom of the drill. 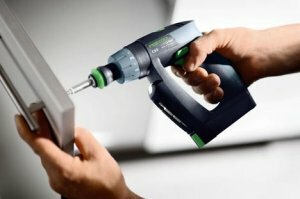 This allowed Festool to design the handle around comfort instead of the battery, and it also gave the tool better balance. Anther feature setting the Festool above the rest is its interchangeable chuck system. Torn between a hex chuck drill and a keyless chuck drill? 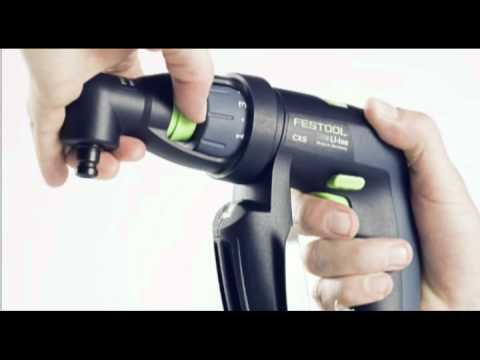 The Festool CXS gives you both in one tool. The CXS battery is capable of driving over 200 screws on a single charge and can be fully recharged in under 45 minutes. Now you can enjoy the features you like most about full size Festool drills in a new compact design. The new CXS compact cordless drill incorporates Festool's patented Centrotec quick-change chuck system. Switch between the keyless chuck, Centrotec chuck, and right angle chuck effortlessly. Weighing just under two pounds and designed for extended use, the ergonomics of the CXS are unlike other compact drills on the market, aligning your arm with the driving mechanism. A belt clip, integrated LED, and on-board magnetic bit stowage add those little touches that making using the CXS a pure pleasure.